Character using a mirror (or other reflective surface) to describe themselves to the reader. We’ve probably all read something like this. I’ve read it in traditionally published work. I’ve read it in self-published work. I even wrote like this myself when I was new to the gig and hadn’t realised why it was such a big problem. So, why is it a problem? This is often the one and only reason people give for it not being an acceptable practice, which is confusing for new writers. 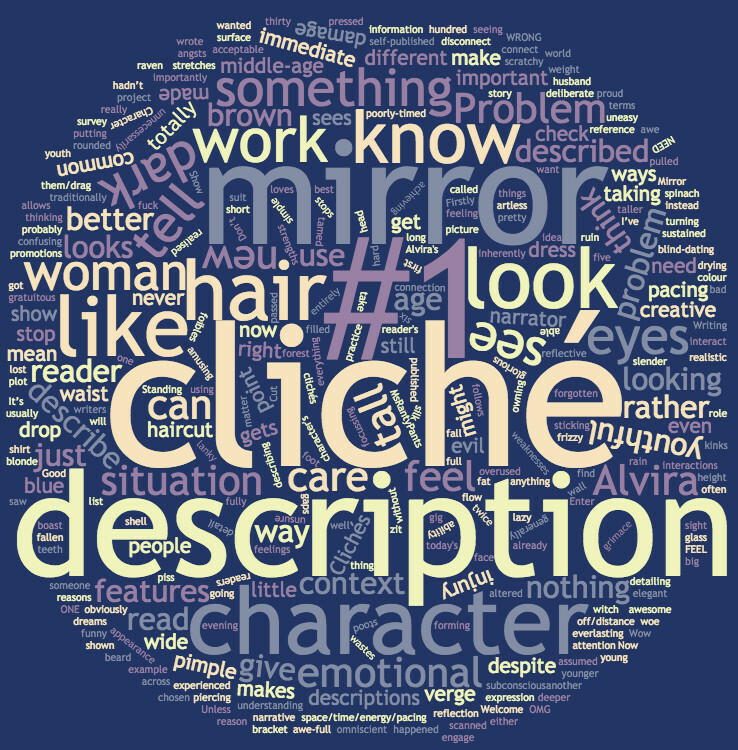 So taking this a little deeper… Clichés are clichés because they work, not only work but work so well that they are overused. Good. No problem. That doesn’t make them inherently bad. But if there are better, more creative ways of achieving the same thing, then sticking to the cliché is lazy. If the cliché gets in the way of your narrative then don’t do it. When we look in the mirror, we aren’t doing so to see what we look like. I know what I look like. I don’t need a mirror to tell me. Problem #3: It gets in the way of a reader’s ability to project themselves into the role of your character. If your description of what your character is seeing in the mirror is different to what your reader sees when they look in their own, there is an immediate subconscious disconnect. This doesn’t mean that we cannot connect to a character that looks nothing like us, but that the artless detailing of features without emotional context stops the reader from being able to fully engage with the character’s feelings. Why do these work better? Because while I don’t have dark hair, I’ve had a haircut that made me FEEL awesome. I’m not tall, but I know the feeling of putting on a dress that just doesn’t suit. And you’d be hard pressed to find someone who has never experienced the poorly-timed pimple. So there is an emotional connection and that is what allows me to care about this woman as I did not care about the woman describing herself in the mirror with whom I had nothing in common. Any point at which there is a deliberate stop to describe something in detail there is an immediate drop in pacing and flow. That doesn’t mean things should never be described, but doing so should not have to stop the story. If you want to show that Alvira looks younger than she is, show it in the way people interact with her – passed over for promotions, assumed to be in a different age bracket when taking a survey, amusing interactions when blind-dating… there are a hundred more creative and realistic ways than having either a narrator point it out to us, or have Alvira boast of it before the looking glass. And if there is no situation in which this can be shown? THEN YOU DON’T NEED IT. Cut out the reference entirely, because your readers obviously don’t need to know she looks youthful despite her age, and the information will just piss them off/distance them/drag the pacing unnecessarily. Is it important for us to know Alvira has dark hair? Is it important for us to know that she is tall? Not everything in a description has to be there for plot reasons, but think twice about gratuitous descriptions that tell us nothing about Alvira’s character, her strengths, her weaknesses, her foibles, her loves, her dreams, her angsts. Unless she’s proud or uneasy about her height, I don’t really care if she’s five foot or six. So when can I use a mirror? The first situation is as described above – simple descriptions with emotional weight and context that give us a better understanding of the character. Where the character themselves is unsure of what they are going to see. Have they sustained an injury – tell us about the injury, but again, if I had fallen on my face and wanted to check the damage I would be focussing my attention on the damage not on the colour of my hair or eyes. The only use for full character description in the mirror is a situation where we have been with a character for a while, we know something about what they look like, have filled in the gaps ourselves, but now they have happened across an evil witch in the forest who has totally altered their appearance. BUT even in this situation, we must give it emotional context rather than turning it into a list. So I have blue eyes now instead of brown? How do I feel about that? I’ve got a beard? How do I feel about that? It’s scratchy and makes me think of my lost husband oh woe is me. You get the idea. Thank you for this…..it was useful. In my case, wondering specifically what the parameters are for using a mirror (or a smartphone screen reflection) to inject some physical description. I think you explained this very well. Loved the Alvira examples.